The Australian sharemarket continued to perform strongly during March, with the ASX200 Accumulation Index closing out the first quarter of 2019 with a +10.8% gain, reversing the slump of the previous quarter. Easing global trade tensions and reduced expectations of interest rate tightening have done much to buoy investor sentiments. Our Momentum Fund again produced a solid result, returning +2.1% for March and outperforming its benchmark by +1.4% for the month. Our Leveraged Fund also produced a strong positive return, gaining +4.7% during March. 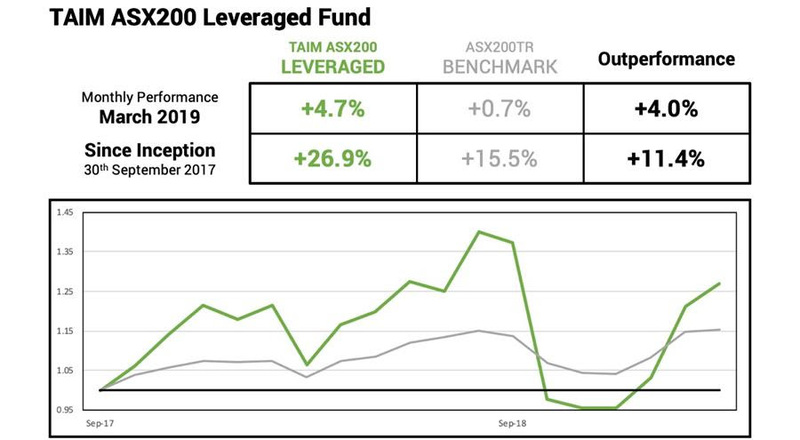 Since inception (18 months) this fund has now provided initial investors with a return of +26.9%, rebounding strongly from the lows of late 2018. 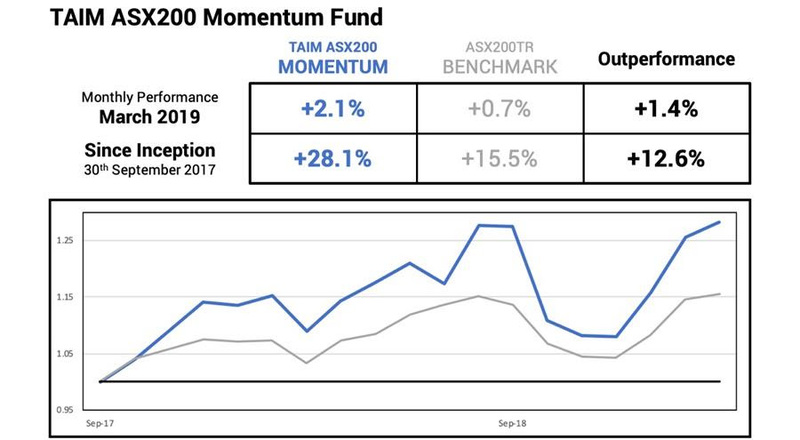 The TAIM Funds have experienced only one down week so far this year and have closed out an exceptional first quarter, with our Momentum Fund gaining +18.6% and our Leveraged Fund gaining +32.9% for the three month period. TAIM Investments operates two Australian equities investment funds. Both have exhibited exceptional performance, during an initial 4-year small-scale-offering period, and now under the company’s own AFSL. Both funds have an Australian blue chip focus – portfolio of 20 ASX200 equities, long only, no short-selling or derivatives – and we use an automated quantitative approach to deliver superior performance.